As Time Goes By 1- Set of 12 Skeins of Valdani Floss. Beautiful Valdani threads are hand over-dyed by highly skilled artisans in customized designer colors. The Three Strand Floss is created especially for punchneedle - you no longer will need to separate the skein, precut or have needless thread waste. 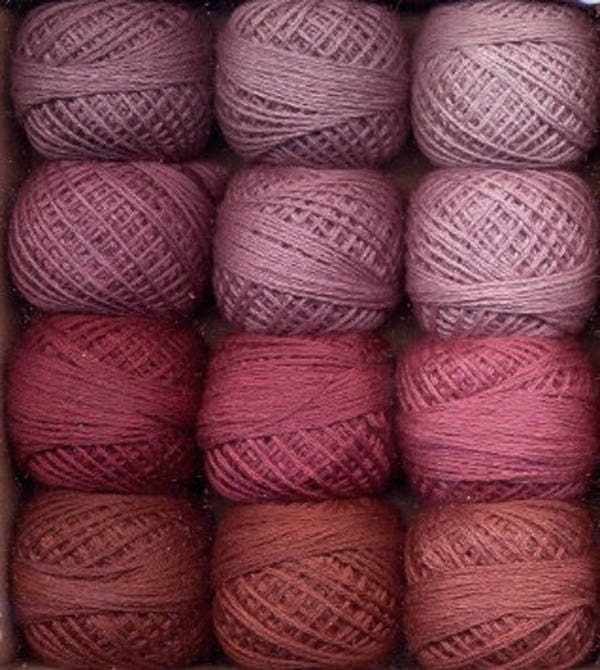 Colors included in Set: 811- Brick/Light, 812- Brick/Med., 813- Brick/Dark, 841- Old Rose/Light, 842- Old Rose- Med., 843- Old Rose/Dark, 881- Distance Mauve/Light, 882- Distant Mauve/Med., 883- Distant Mauve/Dark, 8101- Withered Mulberry/Light, 8102- Withered Mulberry/Med., 8103- Withered Mulberry/Dark.